These lovely treats can be made up to 4 days in advance though store in an airtight container. Place the flour, icing sugar and butter in a bowl and combine together until it resembles fine bread crumbs. Add the egg yolk and process until dough just comes together. Wrap in cling film and place in the fridge until ready to use. In a small saucepan heat the jam over a medium heat until dissolved. Add in the whole raspberries and stir until the raspberries are slightly broken down. Roll out the pastry until 3 mm thick. Use a 6.5cm diameter round pastry cutter to cut 22 discs from the pastry. Line the muffin tray with the pastry discs and prick the base with a fork. 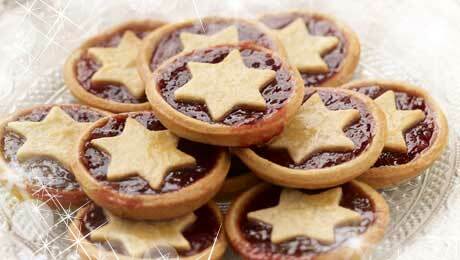 Roll out the remaining pastry and using a 5 cm diameter star-shaped cutter to cut 22 stars. Spoon jam mixture among pastry cases. Top with stars and sprinkle with caster sugar. Bake for 20-25 mins or until golden.